Cape Town, set in stunning scenery, has a fascinating backstory and an excellent food & wine culture. Our 5 day Cape Town itinerary captures all that is great about this African city. There is a lot we like about Cape Town. A melting pot of native African and European colonial culture set in a truly beautiful location. Mountains drop into blue oceans where powder white beaches provide home to penguins and seals. Clifftop drives and hilltop walks offer breath-taking views that Cape Town has become famous for. It also has some of the best value high-quality food in the world. Eat in Constantia or in the bars and restaurants around Kloof Street and you will find culinary innovation at a fraction of the price of many other destinations. Our 5-day Cape Town Itinerary explores the history of this once troubled town. Apartheid only came to an end 25 years ago and visiting Robben Island, District 6 Museum and a township helped us to learn more about these policies and the challenging legacy they have left on this town and its people. Cape Town is a great place to visit and it can easily be incorporated into a much longer stay in South Africa, one of our favourite holiday destinations. You can see what we got up to in our 3 week South Africa itinerary. WHY GO TO CAPE TOWN? Our 5-day Cape Town Itinerary: Fascinating history and beautiful scenery. AM / Start today with a visit to District Six Museum, which tells the story of the forcible ejection of local multi-racial communities from the Sixth District in inner Cape Town. It has both permanent and temporary exhibitions and excellent guides offering personal insights into the museum. After the museum, grab a coffee at the excellent Uncle Bear Coffee Company before exploring the tourist market at Greenmarket Square and the old colonial buildings surrounding Company Gardens. Next, grab lunch at Yours Truly perched on a stool watching the world go by. PM / In the afternoon wander over to Bo Kaap. Bo Kaap has a rich multi-cultural heritage, thanks mostly to the descendants of slaves who were brought over in the 16th and 17th century. Today it’s an interesting place to stroll around and admire the colourful houses. Check out the museum. Although the exhibits are average, a good TV presentation documents the residents of Bo Kaap as they reflect on their life and the development of their community. Explore the shops of Loop and Long street before grabbing an early evening drink at The Gin Bar on Wale Street. AM / Start today by heading into Langa and taking a morning Siviwe Township Tour. Langa is a small tight-knit township, just east of Table Mountain. Touring this township opened our eyes to how many of Cape Town’s citizens live and the ongoing legacy of apartheid. It was one of our best experiences in Cape Town which we highly recommend. Next head over to Constantia and join the Constantia Wine Route where you can stop at numerous vineyards and try their food and wine. Groot Constantia and Fairview are a must for tastings, and Buitenverwachting is a real treat for lunch, with a café and restaurant serving excellent food. But be there before 2 pm otherwise you might have to do some fast talking to convince them to stay open for you! PM / Before the afternoon completely disappears in a haze, make your way to Kirstenbosch for a leisurely stroll around the botanic gardens. If you are here in summer try to tie it up with one of their outdoor summer concerts, which are truly excellent. RELATED / SHOULD YOU TAKE A LANGA TOWNSHIP TOUR? AM / Day 3 of our 5-day Cape Town itinerary takes us up the Table Mountain Cableway for stunning views over Cape Town. Booking ahead is essential as it’s a popular spot for locals and tourists alike. With or without pre-booked tickets it’s likely you will need to queue, so get there as early as possible. But fear not, your precious time is not wasted as the views across Cape Town, Lion’s Head and the endless expanse of ocean is well worth the wait. After descending in the cable car, head the short distance to Kloof Street and grab lunch at one of the many options in the area. Kloof Street House was our pick. PM / Time for a bit of R&R, so head over to the beach of your choice for some sun, sand and remarkably cold sea. Camps Bay is a curving wide stretch of beautiful white sand. The four Clifton beaches under lion’s head each have their own vibe. Bloubergstrand, about 20-minute drive from town, has great views back to Table Mountain and is a great spot for kitesurfing. End the day with dinner and drinks at one of the many establishments overlooking Camps Bay. It’s sloppy tourist driven fare, and a far cry from authentic South African foods you need to try. But the view, energy and sunset make up for it. AM / This morning take the Robben Island Museum Tour and learn a bit more about the era of apartheid. Robben Island was used by the South African government as a prison for political prisoners and convicted criminals from 1961 until 1991. Today the island is home to a number of former inmates who work as tour guides, providing very personal – and at times – harrowing accounts of their experience in the prison. Ferries to Robben Island depart from Victoria and Albert Waterfront and booking in advance is recommended. The whole trip takes around 4 – 5 hours. Upon your return explore the V&A Waterfront and grab lunch at the Waterfront Food Market. PM / This afternoon hike up Lion’s Head. The well-trodden path winds its way up the mountain and offers spectacular views of Cape Town, Table Mountain, the Twelve Apostles and Camps Bay beach. The views from the top are stunning. Make your way to the top by late afternoon as the sun drops and the surrounds are lit up in all their golden glory. If you take a couple of beers with you to the top, you will have a truly memorable moment. Lions Head Walk / Park 500m up Signal Hill Road, just after turning off the M62 at Kloof Neck. The path is easy to follow. There is a bit of scrambling towards the top, but if the sight of ropes and ladders leaves your palms sweaty, walk a bit further and you’ll see another path avoiding these tricky bits. The walk takes around 1 hour, 15 minutes up and 1 hour down. AM / Today, enjoy a driving tour of the spectacular Cape Peninsula. Take the M6 down to Harbour Road in Hout Bay, home to a traditional fishing harbour and market, which offers some excellent seafood and a cool seaside vibe. After a walk around Hout Bay Harbour, head to Cape Point via Chapman’s Peak. This is a toll road, but you will not resent the small payment one bit; the drive is nothing short of spectacular. Once the M6 hits the M65, turn right and go via Kommetjie, taking the circular route around the peninsula. About 1h 20m after leaving Hout Bay you will arrive at Table Mountain National Park. Pay the entry fee, then and follow the signs to The Cape of Good Hope. Walk up the hill nearby and keep your eyes peeled for whales. After you’ve soaked up the views, drive up to Cape Point, walk up to the new lighthouse and out to the point that looks down over the old lighthouse. PM / Back in the car, head up the east side of the peninsula to Boulder’s Beach (35min) and have a quick visit with the penguins. Continue to St James (25 min) and walk to the much-photographed brightly coloured beach huts framing a tidal rock pool. Next head back south to Kalk Bay, to check out its coffee shops and bohemian vibe before having dinner at Livebait, a great, reasonably priced seafood restaurant so close to the front the waves are lapping at the deck. Get there while it is still light to watch the sun go down. Chapmans Peak Drive / Anytime / Price: R47 other tariffs are here. A little pre-planning and research will help make your travels far more successful, it will also help you to understand what you are looking for in a destination. If you like our itinerary, here’s some further information we think you might need to plan your own 5-day Cape Town itinerary. Cape Town international airport is a 20 to 30-minute drive from the city centre. It has decent direct flights to southern Africa, the Middle East and Europe. But many visitors may find it cheaper and easier to connect in Johannesburg. We find Google Flights a very quick and easy way to start comparing prices before digging a little deeper. We advise you hire a car at Cape Town Airport. Car hire is good value and makes getting around much easier. Parking is generally easy and cheap and the roads are good. The excess for accidents is generally low so we did not get any car insurance. Cape Town can be visited all year but it is best to avoid the wet colder months of July and August. If you want to spend time on the beaches then the summer months of December to March bring temperatures in the high twenties and longer days, but also higher crowds. We recommend mid- January to mid-March to get good weather, long days, fewer crowds and the opportunity enjoy wine festivals and outdoor concerts. Beware though, the seas around Cape Town are cold almost all year round, so swimming takes a deep breath whatever time you travel. If you are following our 5-day Cape Town Itinerary it is worth checking out both hotels, rental apartments and Airbnb. When staying in a city we always recommend spending less on accommodation facilities and more on location. Tamboerskloof and Camps Bay are both excellent locations but for different reasons. Tamboerskloof (as near to Kloof Street as you can) is younger and cooler, close to the city centre, has easy access to a wide range of bars, coffee shops and restaurants and great views up to Table Mountain. Camps Bay, on the other hand, is a bit older, but stunningly set on one of the most beautiful city beaches in the world, with cocktail bars and restaurants lining the front. We booked three nights in each using Airbnb, making sure both places had free parking. Cape Town can get very busy. Book the Robben Island Tour, Siviwe Township Tour and Table Mountain Cableway before you arrive. The Table Mountain Cableway can close when conditions are windy, if so your ticket is valid for a later day, but it means you may need to be flexible and you should plan to go up on your last day in case it is closed. Furthermore while booking online does not skip all of the queues, it does make it considerably quicker. If you are visiting in the summer months please check Kirstenbosch events. The summer concerts in the gardens are excellent. If you are a sports fan then Cape Town is an excellent destination. It is relatively easy to get tickets to world-class rugby and cricket at extremely good prices. Not to mention, Newlands Stadium is a stunning destination with great views over Table Mountain. As always the Lonely Planet Cape Town & Garden Route guidebook was a very valuable addition to our toolkit while in Cape Town. For some interesting reading, The Scramble for Africa by Thomas Packenham explains the history of how African territory was divided between European powers between 1881 and 1914. Mandela’s Long Walk to Freedom is a powerful account of the struggle against apartheid with many key events taking place in Cape Town. Cape Town is a stunning destination but so is the rest of South Africa. If you head to one other place, go to Kruger National Park. A self-drive safari here is a truly remarkable experience, as is the more upmarket Sabi Sands Private Reserve. You can also check out all the best experiences we had in South Africa or simply peruse our other articles here. Or if you are struggling to put your South Africa trip together, then see how we did it in our 3 week South Africa itinerary. Finally if you are thinking about South Africa you might also want to consider Namibia. Our 2 weeks in Namibia was the best holiday we have had for many years and you can find all the highlights of that trip here. First of all, I must say that you have taken stunning pictures of Cape Town. I loved the Bo-Kaap area where everything is so colorful and photogenic. I love to take pictures of colorful houses and therefore I would end up taking thousands of pictures there. Going to Robben Island, Table Mountain, and Cape Point Peninsula must be in my first priority here. Thanks for sharing all details. Thanks, Yukti! I love taking photos of colourful houses as well and don’t worry, I’m sure I have thousands yet to sort through as well. You’re in for a treat if you haven’t been to Cape Town yet, it’s an amazing location. Thanks very much. It’s a cool place to visit – with some interesting history – so we highly recommend it. Thanks, Erin! You can take it from me – a self-proclaimed expert on such matters – the food in Cape Town is top notch! Everything is very “on-trend” and the scenery you’re dining in makes it all the more special. Thanks, Kate. Glad we could provide some reminiscing for you. There’s so much variety in Cape Town it’s ridiculous. The food, the wine, the incredible scenery, beaches, beautiful weather – it’s a fantastic destination. Thank you. I hope we didn’t leave anything out! Thanks very much, glad you liked it! It’s a great town for exploring lots of different things and the setting is absolutely stunning. 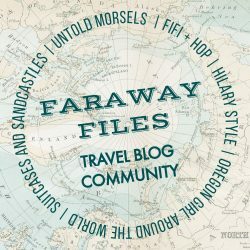 Very informative post and some great tips, Cape Town maybe on our itinerary in 2019, so, will certainly pin for ideas. Thanks, Janis. Looking forward to hearing about your trip there. Thanks so much. Those colour buildings are my favourite part of Cape Town, there’s always plenty of people taking photos in front of them. Great informative itinerary with stunning phots. Definitely saving it for the future reference. Thanks for sharing it! Yes, Camps Bay is an excellent location – such a great beach with stunning views of the mountains. Cape Town has been on my travel wish list for awhile and this seriously gave me such travel envy. I love all the colors you captured. I was familiar with Table Mountain, penguins and the wineries but not about the other interesting things on your itinerary. This is such a helpful post when we finally make it to this beautiful part of the world. Thanks, Mary – glad you found it useful. It’s a fantastic holiday destination: beaches, wine, views, walks, culture, history. Can’t really ask for much more!